What an exciting week learning about Europe!! What do we love most about learning about Europe… ART of course. We were inspired to create beautiful artwork in Group 4. Drip Drip, Splatter, Splash a Collaborative Watercolor Painting! Cezzane, Matisse, and Sonia Delaunay inspired us to create beautiful Artwork. Original Ancient Artifacts from clay were very fun to create! The Red Group kicked off our adventure in Discoveries by getting to know our new friends and traveling to North America together. Our friends practiced greeting one another, sharing our thoughts and excitement about the day, and singing songs during Morning Meeting. We listened to read alouds and learned about traveling with passports and on airplanes to see different parts of the world. We read a story that gave us the opportunity to explore the airport and the events that take place leading up to boarding the airplane and arriving at the destination. Our friends completed crafts of an airplane and the earth to represent how we can travel around the world and to remind ourselves that learning can take us anywhere! Focusing on our theme this week, we studied our country’s flag and important symbols and landmarks that can be seen when exploring North America. We are so excited to continue our journey around the world with our new friends! Next stop- Australia! Learn Boldly with D-E 360° Summer Connections 2017! Enjoy “a la carte” weekly more intensive 1-,2- and 3-week offerings in STEM, from Meteorology and Model Rocketry to and STEM Challenge and Coding with Raspberry Pi. Taught by expert faculty, with many courses in the beautiful new $20 million Hajjar STEM Center. Farewell D-E 360° Summer Connections 2016! In the photo above: String Society 2016 participants prepare for their Grand Finale Concert on Friday, August 12, 3:00 PM in Hajjar Auditorium. The annual program for exceptional student ‘stringers’ offers intensive small ensemble, large orchestral, and even innovative ‘conductor-less’ performance opportunities. Summer 2016: What a Great Time It’s Been! It is hard to believe that seven weeks have passed by so quickly. We have a great deal to celebrate about D-E 360° Summer Connections (SC) 2016. Throughout the course of the entire program, wonderful hands-on learning has taken place. Our campers were immersed in experiences that introduced to them many new passions, from academic classes in math, science and writing… to yoga, entrepreneurship, STEM Challenge, and Soccer Academy. Our youngest campers in Junior Day Camp and Discoveries and Adventures explored all the excitement that the Olympic games in Rio offers. Take a look at our online Photo Gallery for some shots of our favorite moments (click here to view, or use the Gallery link located either at right or scroll down on your mobile device). We’ll surely miss our super summer learners as they head back to school, and we look forward to connecting with everyone again next summer for more exciting programs. SURVEY Opportunity: We Want to Hear from You! The D-E 360° Summer Connections (SC) Team would like to thank you for participating in our program this Summer 2016! Your participation in our Parent/Guardian Survey provides us with important feedback that allows us to learn how we can better meet your needs. The individual answers will never be disclosed and all information will be strictly confidential. Since the Surveys are completely anonymous, you should include your child’s name in a comment if you wish to refer to your specific situation. Thank you, in advance, for your participation in helping us better serve all of our students. If you have any questions, please feel free to email us at summerprograms@d-e.org or call the office at (201) 227-3144. This is also the last chance for SC families to pick up any lost items from our lost and found cabinet located in the SC Main Office, in the Imperatore Library. Anything left after Friday, August 12, will be donated to a local charity. Mark your calendars for D-E 360° Summer Connections 2017, which will run from June 26 to August 5, 2017. We’re beginning to work on the catalog of offerings for Scholars and Enrichment, but please take a sneak preview of the themes for Adventures & Discoveries campers next year. This is It: Final Week of D-E 360° Summer Connections 2016! In the photo above:”Little Kickers” program participants enjoy ‘The Beautiful Game’ , led by D-E Girls Varsity Team Coach and legendary soccer instructor Eddie Ballas! For more photos and to learn more about all our Discoveries & Adventures (D&A) Programs for our youngest campers, check out the D&A posts located at right or below (on your mobile device). 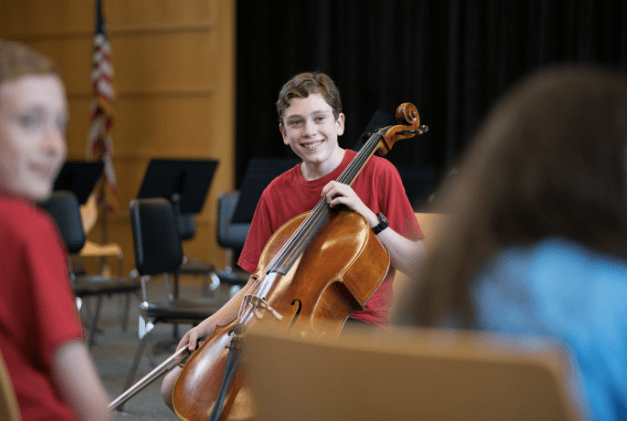 Summer Store, String Society 2016, & Last Chance Enrichment Sessions! Next week will also be the last chance to pick up any lost items from our lost and found cabinet located in the SC Main Office, in the Imperatore Library. Anything left after Friday, August 12, will be donated to a local charity. LIVE! Summer Showcase Events Friday, August 5! Orchestral fans, make a note: String Society, a wonderful annual musical tradition of D-E 360° Summer Connections, will be in session starting Monday, August 8. Co-led by D-E’s own Annaliesa Place (violin; StringJam director) and Diego Garcia (cello; D-E Middle School Orchestra Director), String Society 2016 proudly welcomes violinist Ayano Ninomiya, violin professor of the New England Conservatory. Annaliesa, Diego and Ayano will work with String Society students in chamber music groups, sectionals, an improvisational workshop, and mindfulness activities such as yoga. A Grand Finale concert is scheduled for Friday, August 12, at 3:00 PM, in Hajjar Auditorium! Don’t miss the String Society 2016 Grand Finale Concert! Last Chance to Sign Up: Enrich your Summer 2016! Next week will be the last chance that students in Grades 5-12 will have to fully enrich their Summer 2016 with fun Enrichment Program sessions in athletics/sports, as well as outdoor gardening, the arts, and so much more. The various Enrichment sessions noted below are just the tip of the iceberg! Click here to learn more and register online today, but hurry! Create Your Own Myth: Interested in Greek Mythology? Students will read, explore, and discuss ancient Greek myths and examine the common elements that they all contain. Paleontology: You are invited to work with and study actual fossils, some of which are up to 450,000,000 years old. You will be able to keep and take home fossils that you have identified for your own collection. Podcasting: Let the world hear your voice, either literally or figuratively. If you have ever been curious about what it is like to be a DJ for a radio show, host of a TV news show, or write your own short play, you should consider this class. Yoga: Creative Arts Yoga combines the practice of Yoga and the Creative Arts. Through the exploration of Yoga postures, children and teens will improve strength, flexibility, and coordination, and feel a greater sense of self. Indiana Jones in History: This class will examine the history and controversies surrounding archaeological expeditions in the first half of the twentieth century, the highpoint of Western imperialism. Creative Games: Students will enjoy a wide variety of dodge-ball-type games and others, in fun and safe ways that are creative and historical in nature. Superhero Project: Spiderman, Batman, Aquaman… you can go on and on with the different names of superheroes, but did you ever think you could create your own? Well here’s your chance. Video Productions: Experience all aspects of creating a short video. Participate in brainstorming ideas, acting, directing, camera work, special effects, sound, and more. Everyone will get a copy of the finished production to take home. Web Design: Have you ever wanted to make a website for all your family and friends to see? Learn to design your personal page showcasing your interests. During the week of August 8, Adventures Group 3 campers will work on projects and activities that relate to the Olympics summer games and events taking place right now in Rio! Additionally, we will discuss and learn about medal counts, countries, sporting events, mascots, and the tradition of the Olympics’ opening ceremony events. During the week of August 1, Discoveries campers will enjoy an introduction to Impressionism, as they create art in a cubist style (with a focus on Pablo Picasso). We will also learn about and pay a nod to the work of the great Impressionist artist, Claude Monet! Week of August 1, A Week of Fun! During the week of August 1, our Adventures campers can look forward to a week of fun! Water Play Day is Tuesday, August 2: Campers should bring bathing suit, towel, water shoes, sunblock, and a change of clothes. Field Trip Day is Wednesday, August 3: Campers will be enjoying an outing to Bowler City in Hackensack, NJ! Theme Thursday is Thursday, August 4: Mis-Match Day! Wear your favorite mismatched articles of clothing. Plaids, polka-dots, and stripes, oh my! Cinema Showcase is Friday, August 5: Campers will enjoy watching Hercules! A Summer 2016 Olympics Preview Presentation; Enrichment “Sizzles”; Discoveries & Adventures Highlights! In the photo above: D-E 360° Summer Connections (SC) Enrichment Theater campers show-off their newly-honed dramatic skills and talents in a recent “Summer Showcase”! Each Friday offers a new set of Summer Showcase events. See below for this week’s offerings! Friday, July 29: Enjoy a Summer 2016 Olympics “Preview” Presentation! 2016 Summer Olympian Epee Fencer Jason Pryor will join his coach, Christian Rivera, as well as coaches Jed Dupree and Patrick Durkan to demonstrate the sport of Fencing for our SC campers of all ages and their families, before they leave to compete in Rio! They are also bringing in special equipment so that the audience can indeed participate in the presentation. The team is lead by three Elite Fencing Coaches: Patrick Durkan (sabre), Christian Rivera (epee) and Jed Dupree (foil). All are former NCAA fencers and US Team Members with National and International competition and coaching experience. Coaches Dupree (2012 London) and Rivera (2016 Rio) are both Olympic Coaches. 2016 Olympic Epee Coach Christian Rivera, 2016 Olympic Epee Fencer Jason Pryor, 2004 Olympic Foil Fencer & 2012 Olympic Foil Coach Jed Dupree and Six-time National Champion Sabre Fencer Patrick Durkan. Enrichment Sessions “Sizzle” this Summer 2016! Students in Grades 5-12 have the opportunity through D-E 360° Summer Connections (SC) to fully enrich their summer with dozens of intriguing, exciting, even sizzling (note our “Junior Chef ” feature below!) Enrichment Program sessions. Geology – The Study of the Earth; Picture Stories; The Beat Goes On; and The Solar System are just some of the MANY fascinating classes that will be taking place during the week of August 1. Click here to learn more and register online today, but hurry! Many Enrichment sessions have only a few openings left. Discoveries & Adventures Highlights: SuperHeroes “Theme Thursday” and Field Trip Fun! Earlier this week our youngest campers in the SC Discoveries & Adventures program enjoyed “Theme Thursday” as SuperHeroes! Inspired by learning about the possible “heroes” of the Summer 2016 Olympics (and heroes of Olympics past), this week all the children were encouraged to wear their superheroes apparel and accessories, and our SC teachers and staff joined in on the fun too. 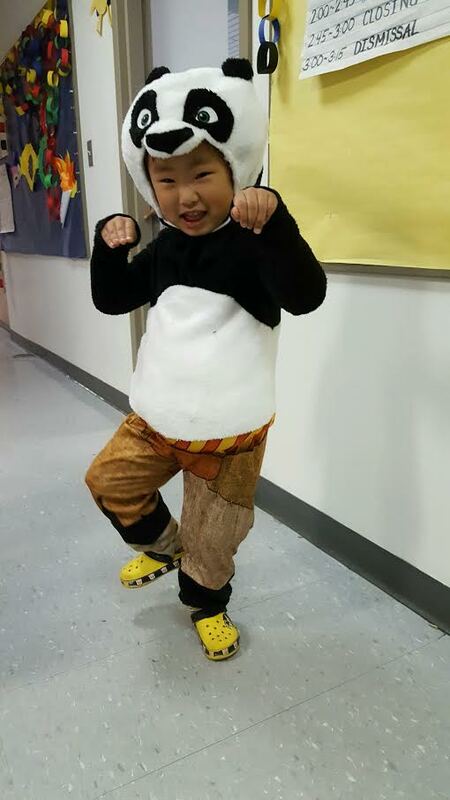 Po (aka KungFu Panda); Batman; Batgirl; Superman… these are just a few of our “superhero sightings”! Field trip fun is another weekly fixture for our Adventures campers. The photos below are just a few from an off-campus outing to the Turtle Back Zoo! For more photos and further details on the Discoveries & Adventures goings-on, check out the “D&A Weekly Updates” posts, all located above right and/or below (on your mobile device)! Enrichment Jr. Chefs Enjoy The Breakfast Club! Earlier this week our Jr. Chefs Enrichment campers learned how to make some delicious french toast kebabs! You too can follow these simple steps to start your morning right. (Thanks to Jr. Chef teacher Ms. Johns for providing this tasty recipe!). Step 1: Whisk the eggs in a pie plate or shallow bowl. Add the milk and cinnamon and whisk until it’s all mixed together. Step 2: Heat a large skillet over medium heat. Melt a pat of butter in the pan and spread it around. Step 3: Dip both sides of each slice of bread into the egg mixture. Step 4: Add the slices to the pan and cook on the bottom. Flip each slice and cook the other side, then transfer to a cutting board. Step 5: Cut the French toast into 1- to 2- inch squares. Cut the strawberries in half and slice the banana into 1/2- inch rounds. Step 6: Slide a piece of French toast, a strawberry half, a slice of banana, and a blueberry onto a skewer. Continue until the skewer is full. Repeat to make more kebabs. Step 7: Serve with maple syrup for dipping or confectioners’ sugar for sprinkling. During the week of July 25, our Discoveries: Red Group campers will continue to learn about the colors of and meaning behind the Olympic rings. In addition, our campers will also be reading stories that emphasize the importance of friendship and caring for one another! For the week of July 25th, our Discoveries campers will hear the story The Three Little Bears as they learn the vocabulary words for the story: Ricitos de Oro, Los Ositos, La Sopita, Una Camita, and Caliente y Frío. In addition, Discoveries campers will learn to count up to 20 in Spanish! Then, they will learn the following colors: azul, amarillo, blanco, y verde (Blue, yellow, white, and green).